Dubai, UAE, September 05, 2018: When it comes to Rado’s mastery of materials and design credentials, the brand has earned its reputation. 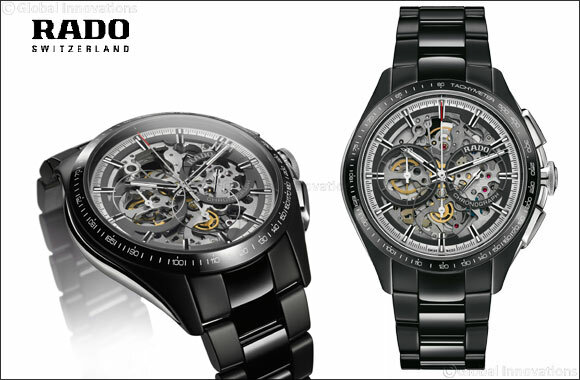 Now Rado is showcasing its prowess in a piece that is straight from the top drawer. Displaying watchmaking ability, design know-how and an understanding of modern manly style, the HyperChrome Skeleton Automatic Chronograph is a watch that’s guaranteed to get a second glance – at the bar, in the gym, in the office or even on your daily commute. Crafted from matt black high-tech ceramic, the HyperChrome Skeleton sports a stark yet subtle look. Created by firing ceramic components with black pigment at 1450°C in a high-tech oven, super hard high-tech ceramic develops its matt black finish through an extensive sand blasting and finishing process. With the HyperChrome Skeleton, you’ll need to look twice because there’s so much to see – and it’s all intriguing. The skeletonised or “open worked” movement has had its plate and bridges cut away, exposing the inner design elements of the movement within. Encased in matt black high-tech ceramic and offset by a polished black bezel, this is as far as you can push transparency and still retain a high level of readability. With lightness, scratch resistance and wearer comfort guaranteed thanks to the full high-tech ceramic construction, this is an all day everday timepiece that is eye- catching and impactful. This is a watch for men with confidence and self-assured style. If this is the watch you want, get used to the attention, because the HyperChrome Skeleton has nothing to hide.